I seem to have received a ton of horror related news in my mail sack this month so this post may well not even go up in September (it didn't! ), all depends on how much headway I make between now and later today (being the final day of the month). Before I start a bit of self publicity in that my humble blog got chosen as one of the 'Top 60 UK Movie Blogs' on the internet by Feedspot! I came in the 41st position which I am more than happy with, no idea how this came to be but I am honoured to have been one of the chosen 60. The list can be found here if you are interested in checking it out. 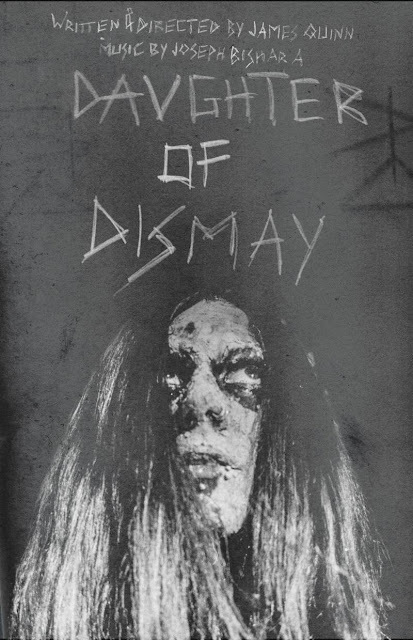 James Quinn (Flesh of the Void, The Temple of Lilith and Sulphur for Leviathan) has started work on his latest short arthouse horror Daughter of Dismay with principal photography that took place on September 22nd deep in Austrian woodland. While the previous films were made using 16mm this one is to be made with 65mm which Quinn states "(will) convey the most breathtaking and epic style the film could have, a style most people know from classic blockbusters, combining it with classic horror elements as well as those of gut-punch dramas." Daughter of Dismay is about an emotionally broken witch who enters dark woodland in order to fulfil her biggest desire, but which requires extreme measures that will have terrible consequences. It is due to premiere on the festival circuit in 2019. Horror comedy Valentine DayZ that was written and directed by Mark Allen Michaels has been released on 25th September on a variety of Digital platforms including Amazon, iTunes, Vimeo and X-Box. Its set during zombie apocalypse so hopefully will be entertaining. American screenwriter Richard Humphries (Seize the Night) has released his debut sci-fi novella Therian Red on paperback and ebook. This is a creature feature that is told entirely from the perspective of the creature itself. The book is available on Amazon in paperback and Kindle as well as Barnes & Noble Nook. Humphries is currently working on his follow up SunChasers. The first official trailer for Harley Wallen's Agramon's Gate has been released. The film is about a spirit medium at a party who has to deal with a demon named Agramon that accidentally gets summoned. Wallen stated that he "wanted to make a horror movie with a good storyline that had good plot and great characters". There is a new American thriller named Noxious that apparently is being streamed over 1,500 times per day in the UK. No idea what the film is about, the trailer has lots of people fighting and arguing so could be about an abusive relationship...maybe? Cynthia is a horror comedy from Girls and Corpses magazine creator Robert Rhine. In this film a desperate mother gives birth to a hideous child. Directed by Devon Downs and Kenny Gage this stars such iconic actors as Scout Taylor-Compton (Halloween, Halloween II), Sid Haig (House of 1000 Corpses, The Devils Rejects) and Bill Moseley (Repo! The Genetic Opera, The Devil's Rejects) among others. It came to Digital and DVD on September 18th thanks to Indican Pictures. Filmmaker Samantha Oci and industrial band Machine Rox have released a music video titled SEAWITCH that has been inspired by mythological subjects such as the Medusa and mermaids. The song was taken from Machine Rox's EP Siren's Spell that is due to be released sometime this month. and The Diary of Anne Frank. The ever interesting Dakota (The Rise & Fall of an American Scumbag, The Acid Sorcerer) has shared some news of his latest film called American Antichrist. As is his style this film will be made up of a series of short vignettes with characters including a serial killer (Dakota Ray) raised from the dead, a deranged religious fanatic (L.B), a sadistic drug dealer (Nick Benning) and a desperate drug addict (Meg Lacie Brown). This is due out sometime in October, for now check out the cool trailer. The final news I could fit into September's news round-up is that of Freaky Fridays! This is a promotion by Terror Films who are due to release a new horror film every Friday in October. These will be released in North America exclusively on Amazon Prime. The line up is as follows...Friday 5th sees The Chair which is about a man on death row forced to confront his own terrible past. This one features the ever awesome Bill Oberst Jr (Coyote, DIS) and Roddy Rowdy Piper (They Live) in his final on screen performance. Furry Nights is out on Friday 12th and sounds awesome. A group of teens head into the woods and accidentally kills a furry mistaking him for a bear, soon the rest of the furries, led by Mr. Fox lead a brutal attack on the group! October 19th is the turn of Flesh Blanket which is a found footage about a morbidly obese director who becomes insanely angry with his cast while trying to make a cutting edge documentary celebrating freedom of speech. Finally is What the Waters Left Behind that comes out on October 26th which is about a group of young filmmakers exploring a formally submerged village that turns out not to be as empty as they assumed.